Today’s guest post is by Mary Beth Stevenson, Eastern Basin Coordinator with the Iowa Department of Natural Resources Watershed Improvement Section. Can you think of the last time you sat around a table with farmers and representatives from multiple Soil and Water Conservation Districts (SWCDs), counties and cities, and elected officials to discuss water quality and flood risk reduction in your watershed? If you live within an active Watershed Management Authority (WMA) region, then these opportunities may arise more than you realize. What exactly can a WMA do? The Iowa Code charges WMAs with assessing flood risk and water quality concerns, identifying conservation and water quality structures and practices that will minimize flood risk and improve water quality, monitoring federal flood risk programs, educating watershed residents and seeking funding for watershed work. The Iowa Legislature authorized the WMAs in 2010 as a response to the disastrous Flood of 2008. Since 2012, when the first six WMAs were established, 23 have now been organized. Currently, 71 counties are covered by at least one WMA, encompassing over a third of the state. WMAs don’t have taxing authority or regulatory authority. In addition, the Iowa Code forbids WMA from condemning land through eminent domain. The collaborative framework of WMAs is established through cooperative agreements. These agreements are common among cities, towns, counties and other local governments to share resources such as ambulance or fire services. WMAs do not create ‘new’ layers of government; instead, they facilitate more efficient government by allowing for shared resources and cooperation. For example, a recent Middle Cedar WMA meeting in La Porte City exemplified how WMAs can open a critical line of communication among rural and urban stakeholders. Representatives from both small towns and larger cities gathered with staff and elected officials from several counties and SWCDs at the La Porte City community center. Many of those sitting around the table were farmers. The chair of the Middle Cedar WMA is Todd Wiley, a Benton County Supervisor and successful farmer. It was powerful to observe farmers actively engaged in discussions with city and county officials, collectively making decisions about project funding and the future of the Middle Cedar watershed. If no farmers had been present at the Middle Cedar WMA meeting, an essential perspective would have been missing. Farmers are an integral piece of the watershed jigsaw puzzle, and their voices are very much welcomed in any Watershed Management Authority. If a WMA exists in your area, don’t be afraid to attend a meeting and be an active participant. After all, it is your watershed and your perspective is a valued and respected part of the conversation. For more information about WMAs, go to the Iowa DNR’s website. A recent article written by Matthew Russell of the Drake University Agricultural Law Center provides some food for thought and discusses how farmers could benefit, both economically and politically, by adopting practices that address climate change. With a continued downturn in commodity prices that began in 2013, farmers might be more open to adding conservation practices to their operation to help their bottom line. Many of the conservation practices already being implemented in the U.S. such as cover crops, no-till, and extended crop rotations can increase soil carbon and address climate change. With higher adoption rates of these practices, and the exploration of new or improved practices designed to increase carbon in soils, farmers stand to profit. So, Russell inquires, will farmers rise to the challenge? Russell notes that The Paris Agreements and the upcoming 2018 Farm Bill are two opportunities for farmers to unite in support of policies that address climate change while also benefiting the individual farmer, especially as forward-thinking farmers are looking for creative ways to manage on-farm income. Last month Iowa Learning Farms participated in a field day about cover crops in Southeast Iowa. After the field day presentations were finished, we were approached by Don Mathews, a farmer from Danville, Iowa. Don shared with us his personal story of how contrasting practices in land management have impacted his land over the past several decades. Don’s story was full of anecdotal evidence about how dramatically soil quality can be changed when conservation practices are continually utilized, or abandoned, after several years time. We want to share Don’s story with you. We hope you will find inspiration in Don’s tale about the positive impact of conservation practices on soil health for those who commit to its use for the long haul! Don Mathews purchased his first eighty acres of land in 1962. In 1975, he purchased an additional eighty acres right across the road. After farming the land for several years, he took on an off-farm job in 1978. Don began to use no-till methods on all of his land in the early 1980s. Soon after, it became difficult to balance farming with his other job and family responsibilities, and so Don made the decision to rent his land out to tenant operators, and transitioned to the role of landowner. Don rented out each plot of eighty acres to two different neighbors. One neighbor continued to use no-till methods to farm his plot, while the other began discing and chisel tilling his plot of land. So began a tale of two side-by-side plots of land, each consisting of eighty acres. These two pieces of land were once managed identically and contained similar soil compositions. Yet when we fast-forward thirty years to the present, Don tells us, the soil in each has become quite different from one another. Don’s 26-year-old son has now taken over all of the original land and is farming it himself. Upon taking over operation of the land, Don and his family began to discover contrasts in soil health between these two plots that had been farmed so differently over the past twenty-five years. Don’s son, who is using strip-tillage on his field corn and no-tillage on the soybeans, is working with his father on plans to incorporate cover crops onto their fields. Finding themselves in a phase of transition as they attempt to get the land back to where they’d like it to be, the Mathews family planted some cover crops this past year, and have plans to add a lot more in the coming years. They also plan to graze their cover crops, to get the added benefit of manure on the land. Don and his son feel strongly about doing what they can to bring the tilled soils on their land back to the same quality of health as the non-tilled soils. Thank you to Don for sharing with us his “tillage tale.” Do you have a story you’d like to share with Iowa Learning Farms about implementing conservation practices? We invite you to share your stories with us by emailing them to Brandy at casehaub@iastate.edu. 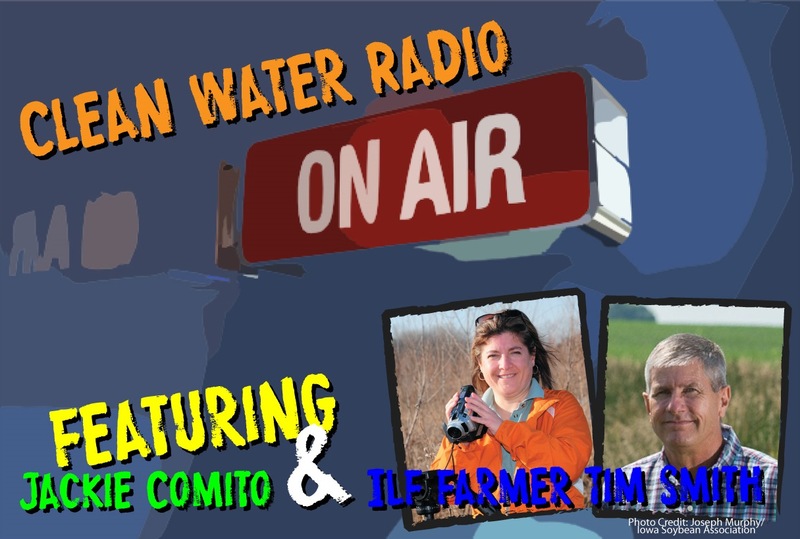 Dr. Jacqueline Comito co-hosted Friday morning’s episode of Clean Water Radio on KHOI 89.1FM. The program was informative as well as entertaining, covering topics ranging from the voluntary nature of the Iowa Nutrient Reduction Strategy to music videos to cover crops and bioreactors. ILF farmer-partner Tim Smith of Eagle Grove was interviewed as part of the program as well. Listen to the program in its entirety at KHOI’s Local Talk website. NOTE: This guest blog post was written by Brandon Friederich, who is serving as a summer 2014 communications intern with Iowa Learning Farms and Water Rocks!. One of Iowa’s leading organizations for the advocacy of conservation farming celebrated a huge milestone last week. 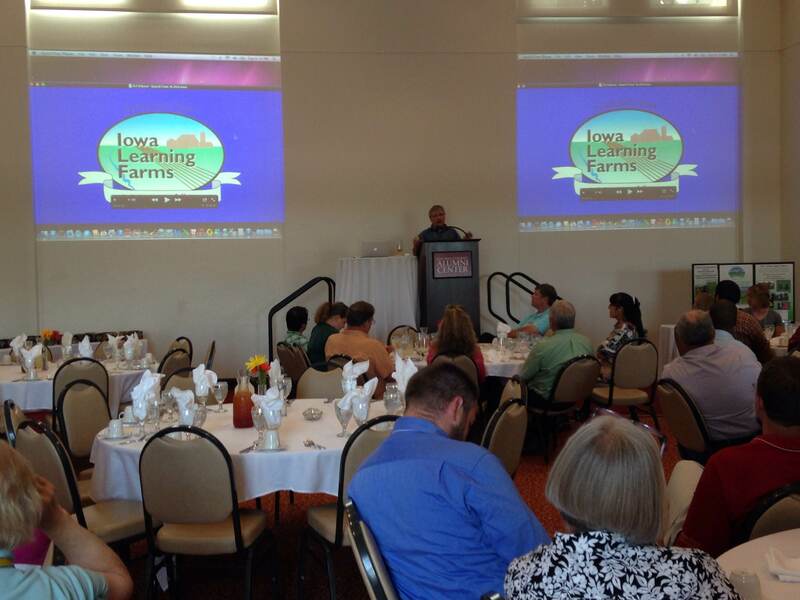 Members of Iowa State University’s Iowa Learning Farms came together on the evening of June 24 to celebrate the organization’s ten-year anniversary. Attendees included Iowa Learning Farms staff as well as scientists, farmer partners, and agency partners who have worked together with ILF over the past decade to promote and research conservation farming techniques. Jerry DeWitt, former Director of the Iowa Learning Farms and Leopold Center for Sustainable Agriculture, offers words of congratulations at the ILF 10-Year Anniversary Celebration, June 24. As reflected by the guest list, ILF’s approach to conservation is made with multiple groups of people in mind. Members of ILF hail from urban and rural settings, and bring different skill sets to the table. There are Iowa State researchers, farmers, and program specialists within the organization. But what’s interesting is that despite these very different backgrounds, members of ILF get along exceptionally well. The event itself looked more like a wedding reception than a research organization celebration. Some ILF members had never met before, but everyone was chatting like they were old friends. This cohesion that exists between such different people is what makes ILF so effective. Researchers work to make improvements on farming techniques, and ILF team members organize outreach events to give different communities, especially farmers, access to the most current data. 139 field days, which are events that ILF holds specifically for members of farming communities, have been held since ILF’s inception, and 7,907 people have attended these events alone. But this number is only part of the puzzle – ILF has reached a total of 85,496 people through the 813 different outreach events that they’ve hosted over the past decade. These efforts provide a great service by bridging the gap between the science and practical application of the research findings. The event was much more than a celebration of members’ decade-long service to ILF. It was a celebration of the success they’ve had in treading through uncharted territory as an organization that takes all opinions into account, whether the opinion is coming from the lab or the field. But their outlook is broad in another way as well. Throughout the night, speakers hammered home the message that the importance of their work pertains more to the future than to the present. The impact that the organization has had over the past ten years is huge, but the impact that ILF will have on the future has the potential to be profound.